Three years ago ZL2AFP introduced a weak-signal QSO mode specifically for the LF/MF bands. The mode has now been updated and enhanced, and is capable of comfortable QSOs at down to -25 dB SNR, so almost as sensitive as WSPR. However, the new WSQCall V1.00 is a QSO mode, and also has selective calling capability, plus automated responses and the ability to send and receive files. The protocol is the same as for FSQCall, so should be familiar to existing users. The WSQCall signal is just 50 Hz wide, is easy to tune, and experience has shown that it will fit between carrier QRM lines on 630 metres. What's more, WSQCall V1.00 also has three notch filters available to knock out carriers. These notches are adjustable in frequency, width and depth. Operating at only 0.5 baud, WSQCall achieves a respectable 5 WPM through the use of a special alphabet and very efficient character coding. 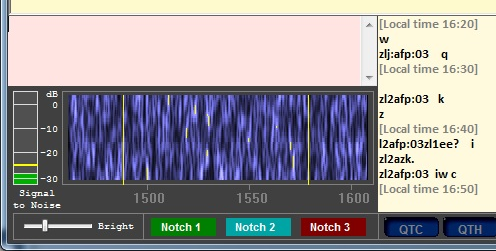 This is a true real-time QSO mode with no timing restrictions, not just a beacon. We have been using this new version for reliable 300 km 630 m contacts DURING THE DAY, and the range at night should exceed 1000 km. You can now read an introduction and download the software for WSQCall V1.00 from ZL1BPU's website.